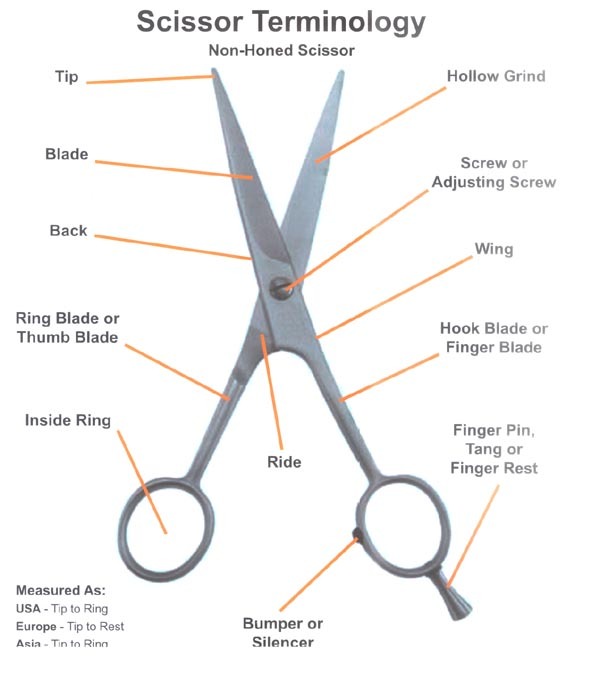 If you would like to know more about scissors like the different types of edges and some of their recommended uses you can read on below. You will also find information about the different types of metal used to make scissors and the different processes used to make scissors. 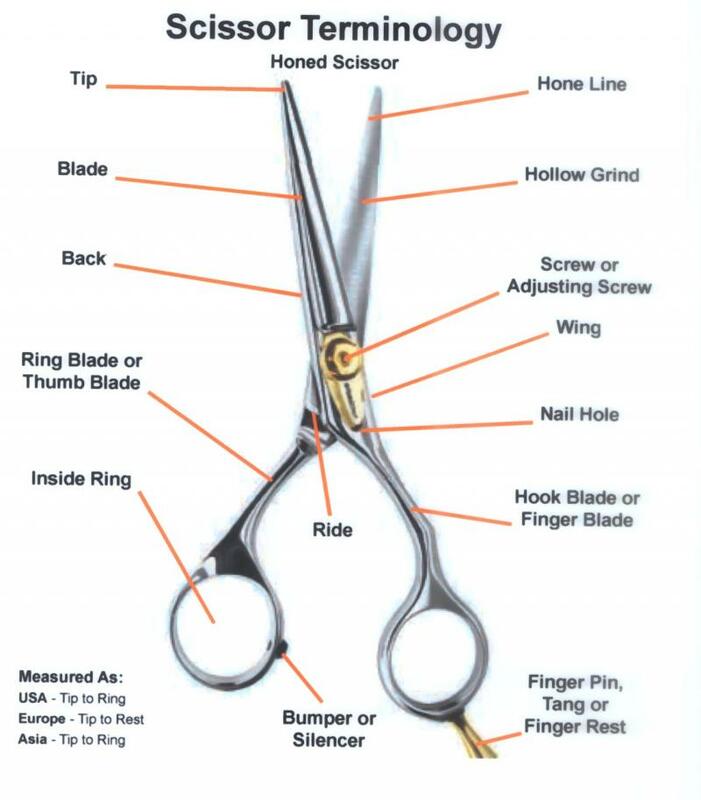 WHAT IS A SCISSOR and WHAT IS A SHEAR? The word "scissor" apparently comes from the Latin word "cisoria," meaning a cutting instrument, and the spelling is due to confusion with the Latin word "Scissor," a form of the verb "scinder," meaning to cut. The word appears in Old French between 842-1300 A.D. as "Cisoires," from which the Modern French word "Ciseaux" derives. In late Middle English, about 1400 A.D., there is found reference to "sisours" and "cysowres." The word "shears" apparently has quite a different derivation, originating from the Germanic/Teutonic root "Sker," which later changed to "Skeresa." In Old English, the word became "Scear." The word in German is today "Schere." Today's modern dictionaries define a scissor as "A cutting implement consisting of two blades joined by a swivel pin that allows the cutting edges to be opened and closed" while a shear is defined as "A pair of scissors" and "Any of various implements or machines that cut with a scissor like action, often used in the plural". What is a Japanese Style scissor? Is it different than a German Style scissor? Is one better than the other for different uses? Is there a difference in caring for different scissors? These are a few of many questions constantly asked in the beauty industry today. Japanese style scissors have very sharp edges that taper to a sharp point called a Convex Edge or Honed Scissor. 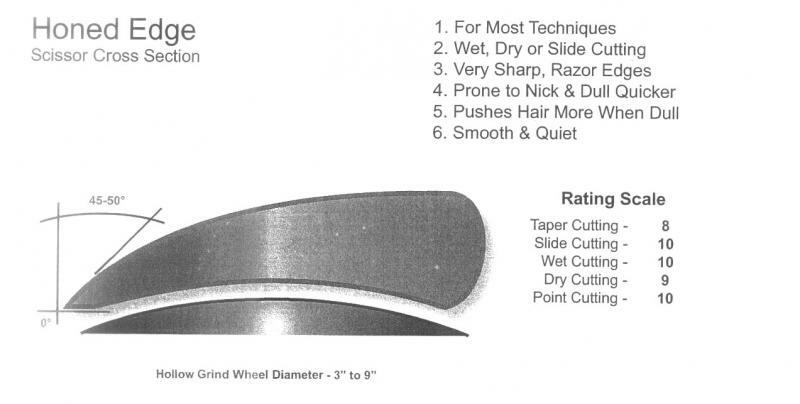 These edges are very thin and sharp allowing the user to use all cutting techniques, including slide cuts, wisping, etc. Because the edges are so sharp, they would rub themselves dull on the hollow side of the edge. To keep this from happening, a hone line is ground in the hollow along the edge. The hone line is the thin flat line that you see on the hollow side of the edge that runs from the tip of the scissor to the back. This gives the scissor a smooth and quiet run. If we did not grind on the hone line, the scissor would run hard and loud. (The run is the feel and function of opening and closing a scissor). If a scissor sharpener does not sharpen and re-hone your scissor correctly, the scissor will never feel like it did when it was new. But if sharpened correctly, the scissor often feels and cuts better than when it was new! A German scissor has flatter edges than a convex scissor. We call this a sword or bevel edge. Bevel edges are not as angled as a convexed edge, thus requiring one or both edges to be serrated or corrugated. Serrations are fine lines or teeth ground into the edge of one blade. The serration holds the hair, keeping it from being pushed forward. Now we come to the performance differences between the Japanese (convex edge) and German (bevel edge) scissors. Because of its very sharp edges, the convex scissor cuts through hair smoothly and efficiently, with less force. The convex scissor is constructed for slide cutting or wisping. It runs smoothly, quietly, and very lightly. However, it has the tendency to nick and dull faster than a bevel edge scissor. It also has a tendency to push the hair more than a serrated bevel edge scissor. The bevel scissor is very durable. It holds the hair very well and does not push it forward. It is the scissor of choice for blunt and layer cutting, dry cutting and for the cutting of synthetic and coarse hair. Its major drawbacks are that one cannot slide cut with it, because of the serration, and it runs louder and rougher than a convex scissor. STEEL - What type of steel alloy the scissor is made from. What grade of steel is it? 300 series, 400 series, etc. This is the general metallurgical composition of the scissor. PROCESS - The processing of this steel. Is it forged, cast, or sintered metal. Was it heat treated correctly, ice tempered, etc.? Even the best steel can be next to useless in a scissor if it is processed badly. MANUFACTURE - The manufacture of the scissor. Is it convexed or beveled. Is it hollow ground? If so, is the rake angle correct, etc.? What Does Ice Tempering Mean? The word "ice" is so popular that a lot of regular carbon steel scissors and shears proclaim to be Ice Tempered, which does not make any sense technically. Some people even think "ICE" is a brand name. The important thing to remember is that ice tempering is only beneficial on stainless steel. To make steel hard, it has to be heat treated. With stainless steel, that means heating the steel above 2000 degrees Fahrenheit. At that temperature the structure of the material is at its optimum. To preserve this structure, the steel is cooled rapidly (quenched) and tempered at about 450 degrees Fahrenheit. Now you have a pretty good hardness and flexibility on your tool except that the chromium in the steel will not permit a long lasting cutting edge. To make the cutting edge last longer, the steel is subjected to about 120 degrees below zero; in other words, "Ice Tempered". The tool is not much harder, but the steel structure is at its optimum. It is virtually impossible to prove or disprove if ice tempering was done, without a steel analysis. The only proof is how many cuts one can get with a scissor or shear before it dulls. What is a drop forged shear? Pieces of steel are heated up red hot and put in a die that looks somewhat like a cake form in the shape of the shear or tool. Half of the form is fastened to a big anvil; the other half of the die is attached to the ram which acts like a hammer. The ram comes down on the steel, forging the pliable steel into the die and giving the steel the form of the future shear. These drop hammers are up to 20 feet high, standing on a 10-foot deep foundation. The ram can weigh 1000 lbs. or more. Because of variances in dimensions of the shears, some of the hot steel is being squeezed out of the die cavity. This creates a large burr which is cut off under heavy presses. Now the still hot shear forgings are cooled off under controlled conditions to eliminate any internal stress. They are then tempered and trimmed. What is a Cast shear? Molten metal poured into a mold that is formed to the desired shape. The casting process leaves the molecules of the metal in such a configuration that the metal becomes very brittle and can be broken if dropped or if the sharpener tries to re-set the blade by bending. Cast scissors are harder and the edge will last longer than a forged scissor but the drawback is that they can break easily. What is a blanked shear? Most less expensive shears are blanked out. Strips of steel are cut out in the form of a shear, like rolled cookie dough is shaped with cookie cutters. The cheaper version of the "Blanked" shears are then ground into shape. For a better quality the cut out "Blanks" are put into a powerful press and the blade is squeezed into shape. Thereby the steel near the edge is compressed and the cutting edges last longer. This means that not all cheaper shears are equally cheap. Drop forged tools and shears are far superior to blanked ones. The material flow of the hot metal being forged and pounded into the cavity gives the steel a much denser structure, better quality and ultimately longer life. Cobalt scissors come in two types. Forged Steel and Powder or Sintered Metal. The powdered metals give the maximum cobalt benefit, but are VERY susceptible to breaking. The powder metal cobalt alloy demonstrates outstanding mechanical properties and cutting performance. Powder metal cobalt scissors are usually composed of a 50% Co (Cobalt) - 28.7% Fe (Iron) -20% W (Tungsten) - 1.3% C (Carbon) alloy. These alloys attain an un-tempered maximum value of 66 to 67 Rc. Forged Cobalt tools are much tougher than sintered metals, but seldom have more than 10% cobalt in them, making them softer with Rockwells around 58Rc.